Dark grey clouds roll in over the hills and thunder rumbles – perfect weather for visiting Glen Innes’ Standing Stones. Oddly, it’s been a fine day until now. A lone Scottish piper in the middle of the circle pumps out an eerie skirl. An elderly man in a red tartan kilt and Tam o’Shanter, leaning heavily on a gnarled walking stick, walks down the hill with a little dog at his heels. He shakes hands with TV personality/actor/dancer Paul Mercurio, the new ambassador for New England North West Tourism. Mercurio looks more than impressed. Popular film and TV personality Paul Mercurio, and sporting personality Shane Crawford recently filmed their shows at Mont De Lancey, sampling some of the produce at the Farmers Market, and sharing duties in the kitchen with Chris Helleren at Les Chésselles. 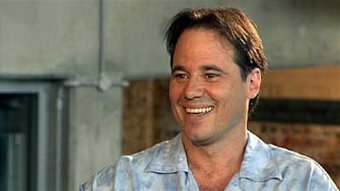 In the first episode of Talking Heads, dancer and film star Paul Mercurio talks to Peter about his relationship with his actor father Gus; relives some of those famous scenes from Strictly Ballroom; talks about the ups and downs of his years in Hollywood; and takes us to meet his family at home before revealing his latest passion. A $130,000 marketing campaign by New England North West Tourism to attract more visitors to the region has been welcomed by the Member for Northern Tablelands, Richard Torbay. Mr Torbay said the campaign, which launches on 27 February and features film and television personality Paul Mercurio, is designed to encourage visitors to consider a self-drive tour of the New England North West. “Aussie film and television icon Paul Mercurio will appear in the campaign and will also be named the new ambassador for the New England North West region,” Mr Torbay said. “I had the pleasure of meeting Paul in Glen Innes last year and he was telling me how impressed he was with the region, I think he is an ideal choice to sing the praises of the beautiful New England North West. “As he is a well-known foodie I’m sure Paul will also take the time to sample some of the great local produce at the region’s outstanding restaurants, cafes, historic pubs and vineyards”. Mr Torbay said the campaign will feature advertising on radio and in newspapers as well as online features such as downloadable touring maps, suggested itineraries and other content designed to attract couples aged 35-plus and families. “The campaign is designed to attract visitors to the New England North West during autumn, a spectacular season to visit regional NSW, and will highlight the range of attractions and experiences for those travelling by car in the area,” Mr Torbay said. Dancer, actor, chef and television personality Paul Mercurio will be travelling to Lake Mulwala on Friday to film an episode for his hit TV show Mercurio’s Menu. Mr Mercurio will be taking a Barby Boat out onto the lake and cooking gourmet meals using local produce from Lambtastic and RichGlen Olives. Ros Vodusek from RighGlen will be Mr Mercurio’s assistant chef for the show. The theme of the show is to promote the Farm Gate Trail and the visit to Lake Mulwala was secured after lobbying by Sun Country on the Murray tourism. The production team will be setting up on the foreshore at Yarrawonga from 9.30am on Friday and people are encouraged to come along and show support for the promotion of tourism around Lake Mulwala. It’s certainly been warm enough to get around in a singlet the past few days, so long as you’ve got your sunscreen on of course, and one man who’s no stranger to strutting his stuff in a singlet is Paul Mercurio – the new face of New England North West Tourism. He’s come a long way since the movie strictly ballroom,and now hosts his own TV cooking show. Food is definately on the menu while he travels around, he’s checking out the wares of Narrabri, Moree, Bingara, Inverell, Glen Innes and Armidale and bringing a host of food writers with him. This is one of the first major promotions Paul is involved in as the new face of New England North West Tourism. This week he’s talking to Anna Moulder to share what’s impressing him about the places he visits. Listen to the interview at ABC New England NW. Hope your day, and the rest of your year, is filled with love! Television personality Paul Mercurio says district residents should look in their own backyard when it comes to buying fresh produce. Mercurio has spent the week in Echuca-Moama filming an episode for his Seven Network show, Mercurio’s Menu, and said he was impressed by the quality produce available in the area. ‘‘There is lots of great produce here,’’ he said.